The SuperSaver screensaver features a new SuperHero, dancing over the screen. You can choose to have up to 32 clones dancing around. If you let them dance long enough they'll wear away the surface and you'll see how big this new SuperHero's ego really is. All images are 3D rendered. SuperSaver v1.0 featured the first appearance of the, at that time still unnamed, hero. 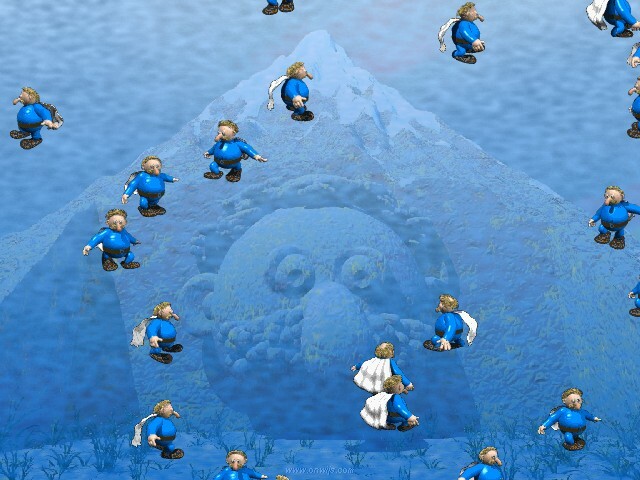 Since then, SuperZero has appeared as Santa in the XMasMan saver, as Cupid in the StupidCupid screensaver and as himself in the math game Multi Maze Mountain 2. Version 1.1 of this screensaver was made in an attempt to fix an obscure bug. At the same time some minor changes were made. Version 1.2 introduced 'behaviour' for the superheroes. Instead of just walking around they attempt to synchronize their movements in some way, failing miserably... Also the 'superhero-look' was enhanced with improved, newly rendered graphics. With this some other changes were made, adding sound (audible and visual) and new graphics routines allowing for more heroes (32 max). - you can choose the number of superheroes running around (1-32). - you can keep the desktop visible as background or hide it with a blue sky.